Home Blogs administrator's blog Solving Connection Issues in The Report Viewer: "Failed to open the connection." The Report Viewer is an interface for Crystal Reports. Crystal Reports is an interface for your database. 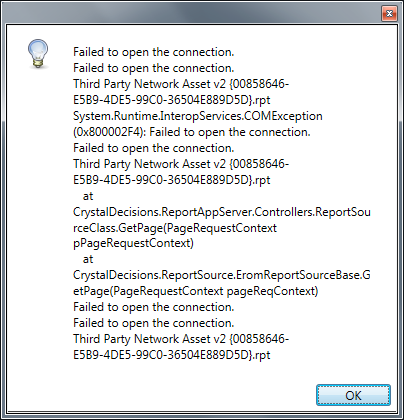 As such, Crystal Reports and The Report Viewer require a database driver be setup and installed, so that it can connect to the database. The database server must give the client PC and user permission to access the data. Read a detailed walk-through covering ODBC setup. There are two ways to configure the software to connect to the data source. This is the preferred method. It seems simple in theory. Simply know the data source that your report references, and setup that data source as referenced inside your report on your system as a 32-bit database driver. To make things easy, we will use ODBC for the example. You have to open up your report in a full install of Crystal, and look at the report expert. You need to see that it uses ODBC, and you need to find the Data Source Name (DSN). Our reporting software is all currently 32-bit software. So, you must use 32-bit (x86) data source administrators. Funny enough, it's in the following location: ( C:\Windows\SysWOW64\odbcad32.exe ). Using the 32-bit ODBC administrator, create a database driver with the same data source name referenced inside the report. It must be case sensitive. Now all should work well. If you have issues, verify your settings and contact us. Overriding the data source is even more tricky. Must also know how the reporting engine expect the override data. 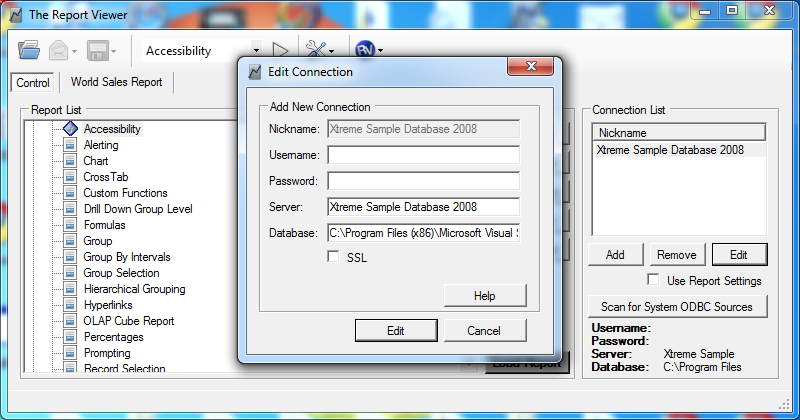 This example is connecting a report to the Xtreme sample databases with Crytsal Reports 2008, using the path to the access database. Note the path is hard coded. To make it more portable, use ODBC. Then, put the ODBC Data Source Name in BOTH the SERVER and DATABASE field.